There are few things that will make one appreciate a grocery store quite like throwing a Native American hunting spear. Assignment #122 in the 365 Things to Do in Memphis is to try it at the C.H. Nash Musuem at Chucalissa. The spears, which are called atl atl, were used for hunting (not warfare). The idea was that you would creep up behind an unsuspecting animal and then lob the spear into it. When people realized how difficult this was, and how limited the range of the arm can be, they developed a tool that hooks into the top of the atl atl and acts as an arm extention. The darts, which are about five feet tall, are made of bamboo and have feathered ends. They're incredibly light, and they don't feel particularly deadly. Still, throwing an atl atl with any kind of range or accuracy is much harder than it looks. Kiran Riar, who works as museum's visitor services / PR manager, gave an impressive demonstration of how to throw an atl atl, and then she handed them to me. My initial attempts at throwing the atl atl (minus the extention tool) were pretty awful. My first arrow bounced off of the grass about five feet in front of me, and my second didn't do much better. Once I got the hang of using the tool – a process that involves both holding it and the arrow, then only releasing the arrow while throwing your arm forward – I was able to pierce the ground. If you want to throw an atl atl at the C.H. Nash Museum, you need to amass a posse. The museum only offers throwing to groups of 10 or more (however, if you bring a group, you get discounted admission rates). The museum is open from 9 a.m. – 5 p.m., Tuesday through Saturday. Individual admission is $3 for kids and seniors and $5 for adults. Group admission is $4 per adult and $2 per child. We went one Saturday with a group of 6, and they offered to let us throw! It was so much fun! And we got in free with student IDs! 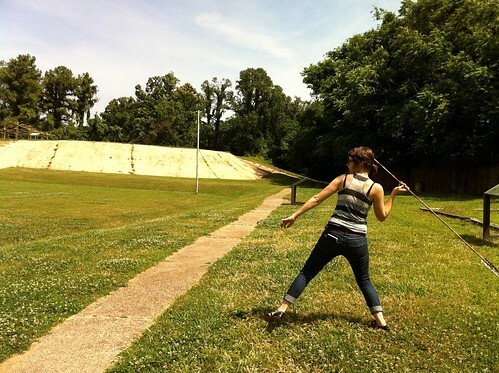 Depending on staffing at the museum, we may be able to accomodate atlatl demonstrations for groups smaller than 10 – just ask at the front desk! Also, for you weapons buffs out there, the atlatl is the extension tool used to throw the darts. Hope to see some of you come by and check it out!